Peatross Champion is just plain nuts. Almost impossible to deal with in limited, he is truly a bomb and easily a five. Constructed he's not as solid with plenty of ways to deal with him. He's almost as good as Spiritmonger. If you're looking for a fatty in black, or like doing 6 to the dome, he's your man, a 4.5. This guy is a fattie boobalattie in the Wakefield tradition. I guarantee that Jamie would have played this guy in the Brothers Grimm back in the day. For those of you that don't know who Wakefield is... ask your older brother. This is a fine card. Not unbelievable in constructed due to high cost and fragility but he is still quite good in the right deck. In Limited he is a solid, high octane bomb. First pick material all the way. He just drains and beats and beats and...well you get the picture. He also looks good in foreign foil. Watson The CHAM-PENE!! This guy is really funny as to where he fits in today's Standard environment. There are some deck that run 1-2 of them "just because." There are some that can play them and just opt not to. Truth be told though, he has a lot of elements you want in a creature. He's big, he has a decent special ability, and he regenerates. In limited, this is not a bad guy to open. His ability to steal life can sometimes be used a game winner. Then when he's not a game winner, he just keeps his day job going as a big monster. The only thing really even remotely bad about this guy is his casting cost. The Champion is one of those cards that can pretty much end the game upon casting it. It's a 6/3 Regenerator that automatically pops your opponent for six when it comes in and can't get hit by most removal spells. What more could you ask for? Andrew Chapman There are reason's this guy is huge in whatever format you play him. He's big, hard to get rid of, and eliminates a third of your opponent's life simply by CASTING him. What more can you possibly want? In Limited, this may be the TOP card to get if you see it. I can't think of anything I'd pick higher. Bill Guerin A good ender, especially since the ability is loss of life instead of damage, which gets around Worship & the CoP:Black and such. However, its converted mana cost of 6 puts it out of reach of hitting the table against 2 major type 2 decks (R/G speed and Tog). However, in limited, it's a beefy body that must be dealt with. Pick it quickly. 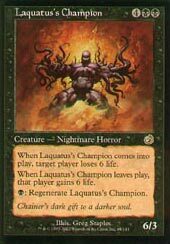 John Hornberg Laquatus's Champion is an okay card. 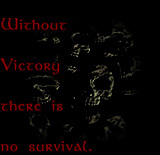 It certainly rounds out a lot of decks, and it's ability to take 6 life can be devastating. Unfortunately, he costs 3BBB, and that triple black in the casting cost can hurt on any deck playing two or more colors. This guys casting cost is intensive, and for that, I give him a 4. A good card, with a devastating ability and huge numbers, but the casting cost gets him. In limited, he's big, he's fat, he makes an opponent loose, life, and last but not least, he regenerates. What's not to love?!? I give him a 5. A hands down first pick in draft.